The second largest animal in the world after the blue whale, the fastest swimming of all the large whales (sometimes called the greyhound of the seas) and the commonest of the large baleen whales. The fin whale is very streamlined in shape, but rather "fuller" than the blue whale, although it isn't as long. Like the other fast swimming whales the Fin is generally free of external markings, scarring, callosities and parasites. The head colouring is asymmetrical though the reason for this is unknown. The head is darkly coloured, other than the lower right side of the jaw which is always white, this colouration also extends to the baleen inside the mouth which is differently coloured on each side. 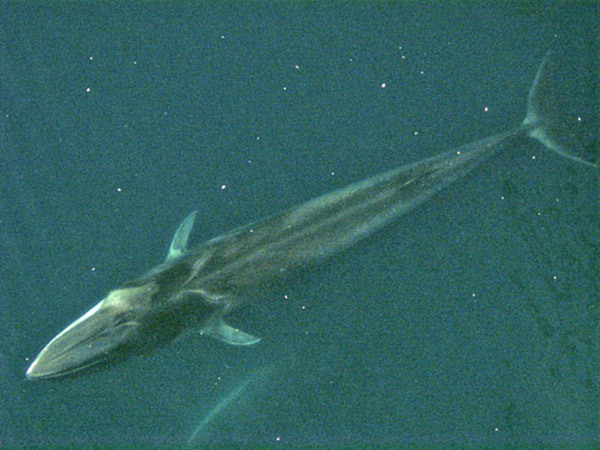 The Fin whale has the characteristic Rorqual pleating of the throat region with anywhere from 50 to 100 pleats present that reach as far down as the navel (being mammals, whales have a tummy button). The pleats allow for the mouth to distend and balloon out when it fills with a mixture of water and fish or other food, the water is then pushed out of the mouth by closing it and using the tongue and the baleen plates then act as a sieve trapping the food. 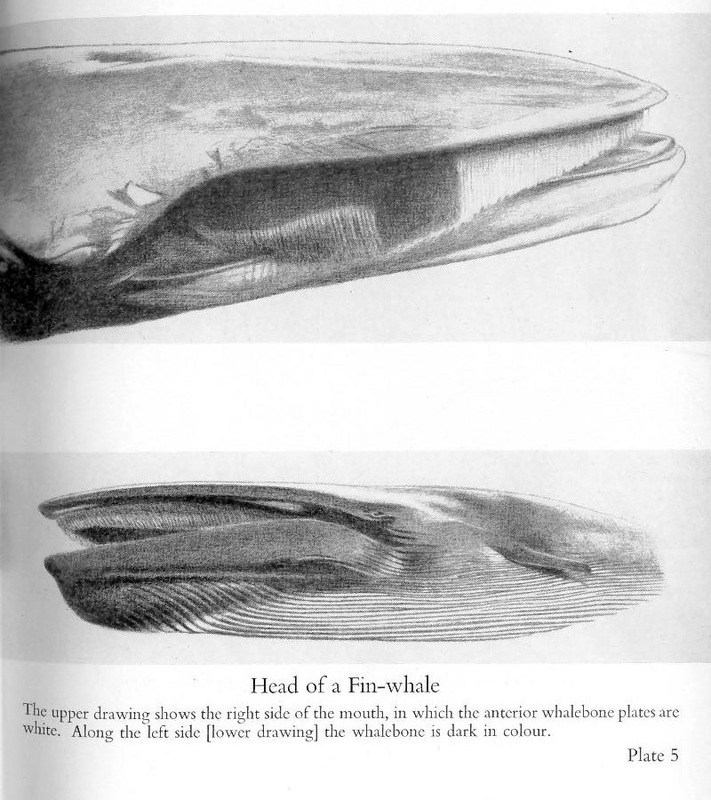 The baleen or whalebone is short, up to around 70cm long by about 30cm wide with from 260-480 plates on each side. Fin whales are more sociable than the other rorquals often being found in small pods of 2-7 individuals (occasionally though rarely up to 20). This kind of behavior is often associated with feeding techniques with the whales behaving co-operatively to be more effective feeders. Fin whales are known to dive deeper than most baleen whales, to 200m for feeding purposes. These behavioral characteristics and feeding behavior add up to Fin whales occupying a different "niche" to the other large filter feeding whales and so allowing them to co-exist in similar regions as they feed on different types or sizes of food. Like other large whales, the Fin's feed in the spring and summer at high latitudes in the Arctic or Antarctic (closer to the poles) and migrate towards warmer waters in the winter months. Fin whales swim about 90 miles (144 km) a day when migrating and have been tracked as travelling as much as 188 miles (300 km) in a single day - pretty impressive for something that travels through the most difficult medium of all, water, using muscle power alone. 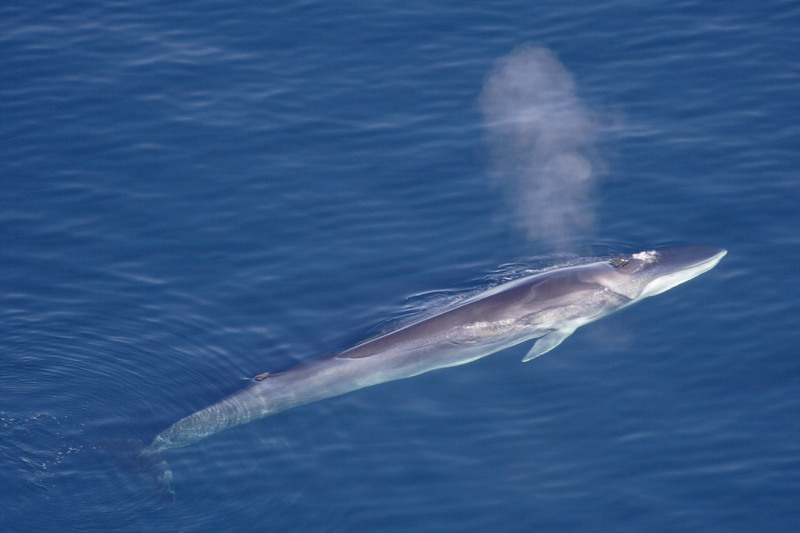 Fin whales can swim at up to 30 mph (48 kmh) in short bursts when alarmed and at up to 18 mph (30 kmh) when migrating and cruising. They often feed by swimming at the surface on their sides scooping up water and prey as they go, this is done on their right sides so that the white lower jaw and baleen are pointing downwards and may be the reason for this asymmetrical colouration. Though smaller than blue whales and not having quite the same prodigious appetite, fin whales have been calculated as consuming as much as 2.8 tonnes of food a day while feeding in Antarctica in the summer months.